Home › Latest Promotions › Experience for yourself. Take a test ride. 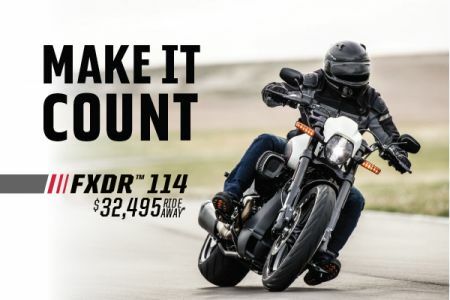 *Ride Away Price available on Model Year 19 FXDR™ 114 in Vivid Black. Solid colour is an optional extra. Promotional Period is 22/1/2019 to 19/8/2019. The $3000 Price Point Offer may be retracted at any time and is only available while MY19 stocks last.